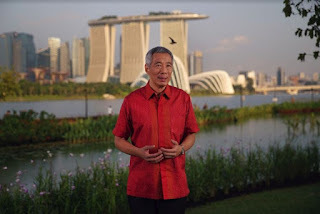 SINGAPORE - Even as Singapore tackles urgent issues such as terrorism and trade protectionism, the nation must also look ahead and prepare for the future, said Prime Minister Lee Hsien Loong on Tuesday (Aug 8), the eve of National Day. Mr Lee called attention to three areas that he believes will benefit the country in the long term. They are: improving preschool education, preventing diabetes and embracing technology in the drive to be a smart nation. He set out his vision in the annual National Day message which he delivered from the eastern section of Gardens by the Bay to underscore the importance of building ahead for the next generation, just as the nation's founding leaders had done. The Bay East Garden was open sea when Singapore became independent 52 years ago, he noted. But modern Singapore's founding leaders imagined a vibrant new downtown for the city, and turned that vision into reality over the decades by reclaiming land and building a new financial district, the Marina Barrage, and Gardens by the Bay. In those years, Singapore had to deal with many pressing concerns, from building the Singapore Armed Forces to attracting investments and creating jobs, housing the population and educating the young, said PM Lee. "But our leaders and people understood the need to look beyond these immediate problems and prepare for the more distant future. Now we are enjoying the rewards of their foresight and vision," he said. Today, Singapore is also grappling with urgent issues at home and abroad amid an uncertain world, he said. He cited several: the need to upgrade the economy and for workers to stay relevant, the major threat of terrorism, and how protectionism is threatening international trade, which is a key growth driver for Singapore. "The Government is working with you on these issues, and we are making progress on them," said PM Lee. On the security front, one major task is to strengthen racial harmony, he said. The Government is also partnering businesses and workers to transform industries and prepare for the future economy, he said, adding that the economy is expected to grow by around 2.5 per cent this year - higher than last year's 2 per cent growth. But at the heart of his speech are the three areas that can help Singapore progress. He will say more about them in his National Day Rally speech on Aug 20, he added. First, the Government will create more preschool places, raise the quality of education, and improve the skills of preschool teachers, he said. He noted that the move will provide parents with more support, and ease the burden of childcare. "We want every child to have a good start in life, and a bright future. We have been investing in preschools, because the early childhood years make a big difference to children not just academically, but for life," he said. Moving to keeping Singaporeans healthy, he singled out diabetes as a big reason for poor health in the elderly. This comes as Singapore's population is greying. Almost one-third of those older than 60 have diabetes, he said, adding that the disease can result in severe ailments ranging from heart disease to kidney failure. "This is why we must go all out to fight diabetes. It is not just about more hospital facilities and better treatment," he said, urging Singaporeans to make healthy lifestyle choices to guard against the disease. This includes exercising regularly and watching one's diet - habits that must start from young, he added. Third, he said the country should harness technology to create jobs and opportunities. While Singapore has a natural advantage of being highly connected and digitally literate, it has to do much better, PM Lee noted. He cited how other countries are using electronic payments to go cashless, building sensor networks to enhance public security and analysing big data to improve public services. Singapore has to learn from these countries, catch up and overtake them, he said, without citing any country. "We need to look ahead and build for the next generation, just as our forefathers looked ahead and built for us," he said. He recounted a question founding Prime Minister Lee Kuan Yew, had posed: "At the end of the day, whom do we owe our deepest obligation to." The late Mr Lee's own answer was: "To the future. Not just to the present. Certainly not to the past." That response encapsulates the spirit of Singapore, PM Lee said. "Always looking ahead, planning ahead and staying ahead, so that when the future arrives, we are prepared for it, to ride it and to grow with it," he added. "That is how we got here. That is what we must keep on doing together, to open up fresh opportunities for ourselves and our children."